Be the first to hear about their new releases and deals. Download the Booksprout app and search for Mitra Elli today! Mitra Elli has spent most of her life with books. 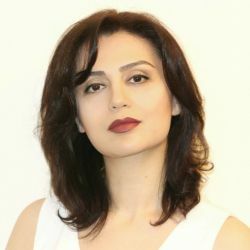 She graduated with Doctorate degree in Dentistry from Tabriz University of Medical Sciences and Master degree in Endodontics from Shahid Beheshti University. She started a successful career as an Endodontist in both academic and practical fields fifteen years ago, until her first son was born. Looking after her baby gave her the chance to get some distance from her stressful job. For the first time in years, she could free her mind from its daily assignments and let it take wings to the infinite realms of imagination, where she found Adamantina and met Richard Brooke. Nine years ago, she moved to the UK from Iran, where she was born and raised, and she decided to turn her passion for writing into a career. She has put as equal an amount of time and effort on her literary progression and development as she has on her job as an Endodontist. Spending endless hours on delving into English literature, as well as conducting a thorough research in different nations’ mythology and folklore in order to provide a solid backdrop for the story are some examples of her endeavors in this quest. There were times when she found her voice sounding like other writers, great names she has always admired. But, it’s been some time now that her voice sounds like her own. She is ready to be heard. Her story has nothing to do with human teeth. Some Monster ones may be involved!